That Wallace is numbered /10 while the Dominguez is /30. It wasn't until a group break pulled the Dominguez that I even knew he had a card in the set. All my saved eBay searches for "Astros" and "Museum" had somehow not picked up on a single one of his cards. So, good to get one, I may have to go after the parallels now. The Heyward is for my slowly growing 2011 Gypsy Queen Auto set. 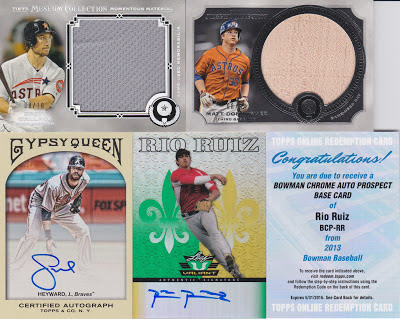 Finally, two Rio Ruiz autos, he was our 3rd round pick last year and we went over-slot to get him. He's doing ok at low A-ball this year but he was a high school kid so he may take a year or two to develop. I've had a few things slip through the cracks on my searches as well, and some things show up on searches they have no reason being there. Like you've said before: "eBay makes no sense." Rio Ruiz is a pretty sweet name. You're building the 2011 Gypsy Queen autograph set? Great choice. Always liked those cards. I've started using some eBay searches on my phone and now I can't stop browsing the listings every 15 minutes it seems! It has brought me several new Tim Hudson cards however so I guess it's not all bad. Love the Heyward - I am always picking up '11 GQ auto's when I can. Seems to get a lot of love from our community, doesn't it ('11 GQ)? Isn't it amazing how such a wonderful release can go so sour in a couple of years! I may have some Astors for you. I'll drop you a line when I can. A #'d Cisneros from '13 Bowman, if I remember the name/team correctly - and more. Interested?